So It happened, didn't it? You went to your favorite aunt's house for Thanksgiving and between the boxed wine lovely cabernet and the sides you've enoyed since you were a kid, your pants may be fitting a little tighter this week. Whats a girl to do to get back on track?! Well here is my go to detox recipe to get those post holiday pounds off in a flash! 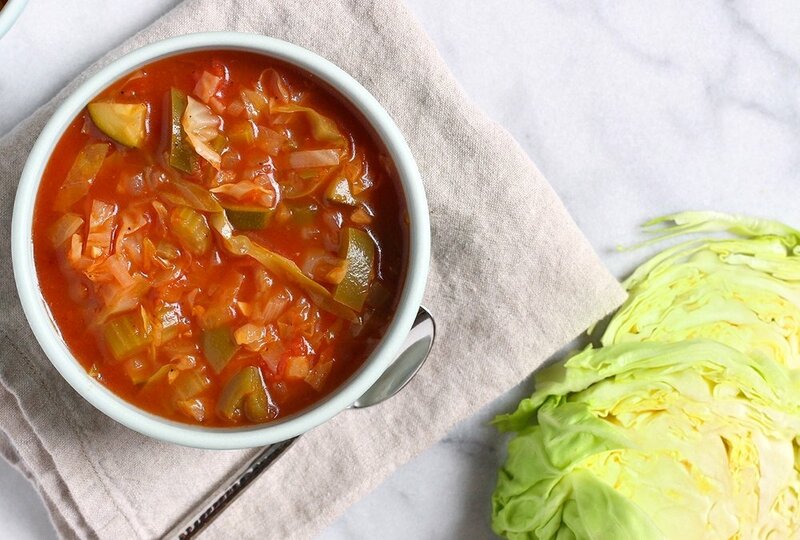 DISCLAIMER: This makes A LOT of soup and should last you a week. Feel free to cut the recipe in half and add your own spin on it! Heat the olive oil, in a large pot, over medium heat. Add onions, carrots and celery. Sauté for about 5 minutes. Add minced garlic. Stir for about a minute. Add chopped cabbage. Stir. Add bone broth (or veggie stock), tomato sauce, lemon juice, and apple cider vinegar. Stir well. Season with desired herbs and chopped fresh parsley. Cover pot and let come to a boil. Once the soup is at a boil, turn heat down to simmer, leaving the lid on until veggies are soft (approximately 30-45 mins). I hope this helps you get back into your skinny jeans for the company holiday Christmas party!